The temple is situated on a hilltop above mean sea level and is surrounded by mountains and dense forests. Kochi: Trekking to the hill shrine at Sabarimala through the tough terrain would require women to overcome many practical impediments. The temple is situated on a hilltop at an altitude of 468 m (1535 ft) above mean sea level and is surrounded by mountains and dense forests. From Pamba, the pilgrims will have to trek the three-km steep mountain path of Neeli Mala before they can start climbing the incline up the Appachimedu and reach Nadapandal. “During the three-month pilgrimage season which starts in the middle of November, the queue often extends till Appachimedu and it would take up to 15 to 20 hours to reach Sannidhanam due to heavy rush. The main issue for the women pilgrims will be the lack of adequate sanitation facilities near the queue complex,” said a TDB official. Another challenge will be lack of full-fledged hospital facility. 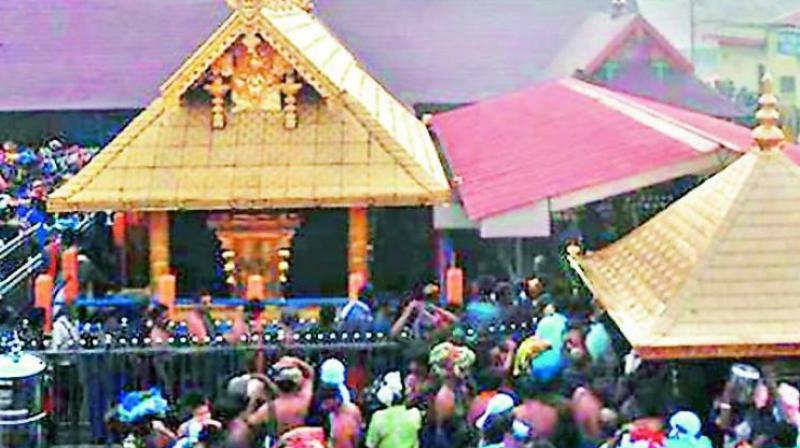 Cardiac deaths in Sabarimala touched 50 in the last pilgrimage season while 59 and 41 deaths were recorded in the previous two seasons before that. Security, too, is expected to be a major worry as the police department struggled to effectively control the crowd. Many anti-social elements, including ganja peddlers, too would try to exploit the heavy rush as was evident in the cases lodged by the cops in the previous years.